(From left) Ananya Birla, Prabhat Pani, Rachel Melsom, Kevin Lee, Franciska Decuypere, and Saurabh Agarwal. Sustainable development is not just about clean energy and using ethical business practices to create better value for shareholders, but also about improving the lives of society with impactful investments in sectors including health care, education, technology and finance. 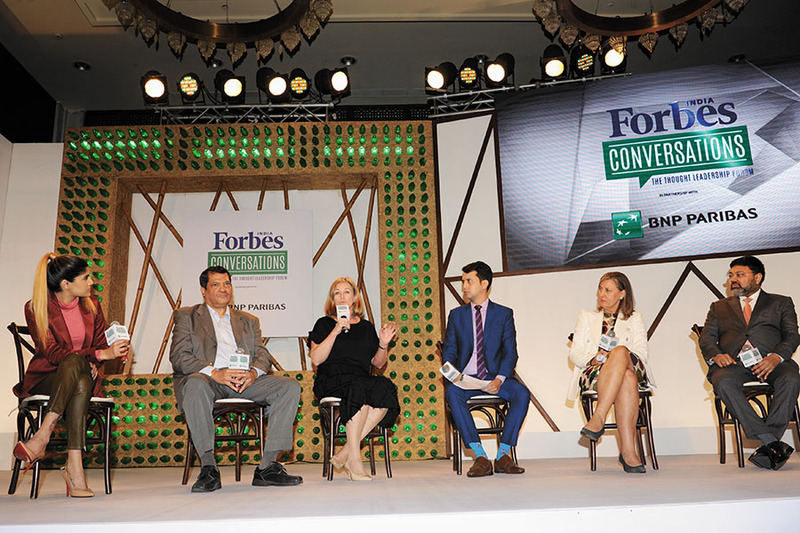 The second edition of Forbes India Conversations—The Thought Leadership Forum, in association with BNP Paribas, brought together some of the country’s top minds to discuss India’s stance on sustainable development, and where it stands in terms of fulfilment of the 17 Sustainable Development Goals (SDGs) set by the United Nations General Assembly in 2015. The leaders deliberated on a roadmap to fulfil these goals. There was also a discussion on the role of sustainable finance in ensuring sustainable growth of the country and its business ecosystem. The event was held on February 12 in Mumbai, and saw two riveting panel discussions with industry leaders. The first, titled ‘The Roadmap to Sustainable Development in India’ comprised Adarsh Natarajan, CEO of medical device startup Aindra Systems; Himanshu Bakshi, director-marketing & HCNS of nutrition products manufacturer Danone India; Pramod Chaudhari, executive chairman of biofuel major Praj Industries; Kuldeep Jain, founder and managing director, CleanMax Solar; KK Maheshwari, managing director of UltraTech Cement, and Umang Vohra, global CEO and managing director of pharmaceutical major Cipla. 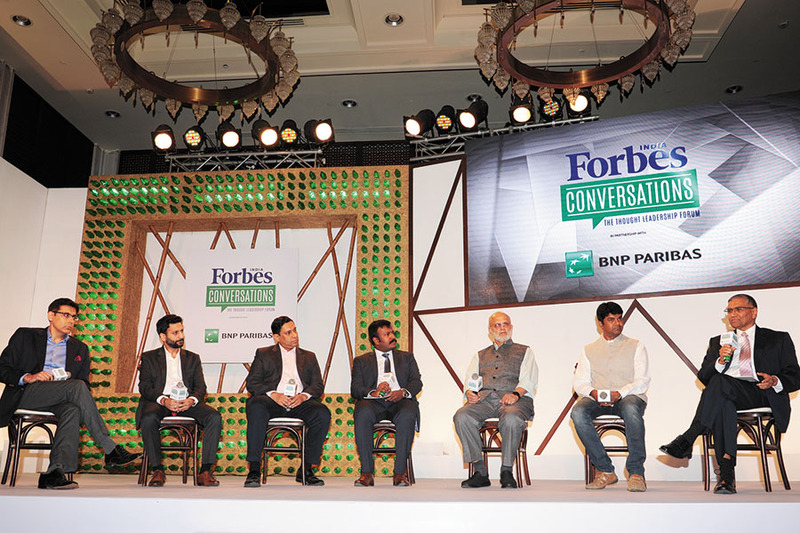 The discussion was moderated by Forbes India’s Manu Balachandran. The panelists addressed how sustainable development is as much the responsibility of the private sector as it is of the government. With access to finance, latest technologies, and larger risk appetite, private companies have a huge stake to enable sustainable growth in the market they operate their businesses in. “Perfect alignment of business objectives to sustainability is required to achieve the long term goals,” said Natarajan. The corporate sector, the panelists discussed, will only be able to meaningfully contribute to sustainable goals if they believe in it “The commitment to SDG goals has to come from within,” said Bakshi. “We, for instance, have reduced water consumption by 50 percent in our operations in the last five years.” Access to clean water and sanitation is sixth on UN’s list of SDGs. The panel agreed that the success of such government initiatives and other steps to ensure the fulfilment of sustainable development goals will depend on a holistic approach toward implementation. The same, the experts agreed, can be ensured by cross-sector collaborative measures and breaking silos achieve the bigger goal. India has the opportunity to take learnings from the implementation of its SDG objectives to other nations, who can then replicate the best practices. The second panel included Ananya Birla, founder, chairperson and managing director, Svatantra Microfinance; Prabhat Pani, head (partnerships and technology), Tata Trusts; Dr Rachel Melsom, director, UK and Europe, Tobacco Free Portfolios; Franciska Decuypere, country head India, BNP Paribas; and Saurabh Agarwal, regional Director (South Asia) for infrastructure transactions at CDPQ. The discussion was moderated by CNBC TV18’s Kevin Lee. According to the World Bank, 70 percent of global greenhouse emissions come from infrastructure development, construction, power plants and transport systems. A report by the Global Commission on the Economy and Climate says that countries around the world will have to invest $90 trillion over the next 15 years just to mitigate climate risks. It is a challenge for developing economies like India to build quality infrastructure and provide efficient transportation services, while minimising environmental damage. “Such ambitious targets of course cannot be met only through traditional ways of funding. That’s where sustainable finance comes in,” Lee said. Decuypere believed there has to be a business case for sustainable finance. It should give returns to investors because sheer nobility cannot go very far. “Carrots and sticks from the government in transition phase can push the agenda of sustainable finance,” she suggested. Why do many once-great companies ultimately stumble?